A small little EP with a new song, nothing special. 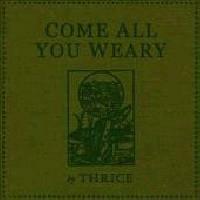 The first track Come All You Weary was a good song at the time and was fantastic when I first heard. I especially love the chorus with Dustin's voice. The second track is The Whaler acoustic, and it's fantastic. I actually want to learn how to play this song acoustic now. Yet again, Dustin's vocals don't disappoint. The third track would be better off if it never existed. I just can never see myself liking this remix. It takes away quite a bit from what was a pretty good song.